At 10PM in the evening on Canada Day, the Parliament Hill fireworks display goes off. 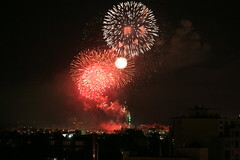 It is a spectacular show – and very visible from my west-end condominium’s balcony. Because I am looking at the show from the west, facing east – I do not have the light advantage of the sunset. Instead, I am being faced with pure darkness. To actually capture this, I had to leverage my tripod – and a remote shoot mechanism. Even the most minute of vibration from touching the camera ruined the shot – as a quick exposure was needed to capture the fireworks without motion blur. I also found the timed/continuous cycle settings of the camera quite useful. Having purchased a higher speed CF card was also beneficial – in order to keep up with the rapid number of exposures being captured. The result? A successful photographic mission under challenging circumstances. I have finally achieved my personal goal of mastering low light photography. Enjoy the results at: http://flickr.com/photos/rdonovan/sets/72157606015772432/.